In short, the world lurched from a very bad situation to an even worse one with increased civilian carnage and an overall inadequate diplomatic response at the United Nations (UN). But this year also saw bright moments of productivity for the community of likeminded governments, UN agencies, the International Committee of the Red Cross (ICRC), and non-governmental organizations (NGOs) pursuing humanitarian disarmament. On December 24, the first international treaty to regulate arms transfers came into effect with a respectable total of 61 states parties after the Control Arms coalition of non-governmental organizations (NGOs) worked to secure and surpass the 50 ratifications needed for the treaty to become binding international law. Adopted by the UN General Assembly on 2 April 2013 and signed by 130 nations, the Arms Trade Treaty aims to reduce human suffering caused by illegal and irresponsible arms transfers, as well as promote accountability and transparency on arms transfers. Now eyes are turned to the treaty’s First Conference of States Parties to be held in late August/early September 2015. December also saw humanitarian disarmament stalwart Austria host the Third Conference on the Humanitarian Impact of Nuclear Weapons in Vienna, launching the “Austrian pledge” committing to work to “fill the legal gap for the prohibition and elimination of nuclear weapons” and “cooperate with all stakeholders to achieve this goal.” Building on the number of participants at previous meetings convened by Mexico in Nayarit in February and by Norway in Oslo in February 2013, the Vienna conference attracted more than 150 states–including two of the five permanent members of the UN Security Council–making it an impressive acknowledgement of the humanitarian discourse on nuclear weapons, which directly challenges the status quo Nuclear Non-Proliferation Treaty (NPT)’s failure to disarm. The International Campaign to Abolish Nuclear Weapons (ICAN) is looking beyond the NPT’s review conference next May at the 70th anniversary of the atomic bombings of Hiroshima and Nagasaki with the expectation that a new legal instrument to abolish nuclear weapons will finally be negotiated. On 1 December, Burma (Myanmar) finally ratified the 1972 Biological Weapons Convention in December after signing it more than 40 years ago, while the convention’s implementation support unit gained a new director with Mr. Daniel Feakes, formerly of the Organisation for the Prohibition of Chemical Weapons (OPCW). Significant progress was made in removing and destroying Syria’s chemical weapons stocks in 2014, but Human Rights Watch and others documented government use of chlorine gas as a chemical weapon in improvised air-dropped barrel bombs. In Washington DC, 2014 finally brought the change long-sought by Senator Patrick Leahy and the US Campaign to Ban Landmines as the Obama Administration announced the outcome of the landmine policy review initiated in 2009. At the Mine Ban Treaty‘s 3rd Review Conference in Maputo, Mozambique on 27 June, the US announced a ban on the production and acquisition of antipersonnel mines, which was followed by an announcement on 23 September by President Barack Obama himself banning US antipersonnel mine use everywhere except the Korean Peninsula, where a Pentagon study is looking at how to overcome “unique” circumstances. The US decision on landmines clears the way for further action on cluster munitions. Universalization efforts in support of the 2008 Convention on Cluster Munitions paid some dividends for the Cluster Munition Coalition in 2014 after Costa Rica hosted the convention’s Fifth Meeting of States Parties in San Jose in September, with accessions from its neighbours Belize and Guyana. But the continued use of cluster munitions in Syria and new use of the weapons in Ukraine threatens to overshadow the ban convention’s First Review Conference to be held in Dubrovnik, Croatia on 7-11 September 2015. The Campaign to Stop Killer Robots has described 2014 as ”a year of progress” after the 1980 Convention on Conventional Weapons (CCW) held its first-ever meeting on “lethal autonomous weapons systems” in May and nations then agreed by consensus to continue deliberations on 13-17 April 2015. Campaigners, however, warned that national policy development will be needed, as well as gender diversity, if any progress is to be made in reining in the trend towards autonomous warfare. In June, Iraq called for a ban on the use of depleted uranium weapons and for assistance from the international community in identifying and clearing contamination. Six months later, the International Coalition to Ban Uranium Weapons welcomed a fifth UN General Assembly resolution calling for assistance to states affected by the weapons, which passed by 150 to four. The December vote came days after the US once again deployed aircraft capable of firing depleted uranium in Iraq, after saying the weapons would be used if needed. This year, non-governmental activists working with or for global humanitarian disarmament coalitions met in New York on 17-19 October for their third annual gathering. The Forum focused on gender as a subject that crosscuts all arms issues, but is often overlooked or marginalized. The focus was timely, coming after four days of all-male expert panels at the first CCW meeting on killer robots and as Germany and the Netherlands convened “manpanels” during UN First Committee on Disarmament and International Security. 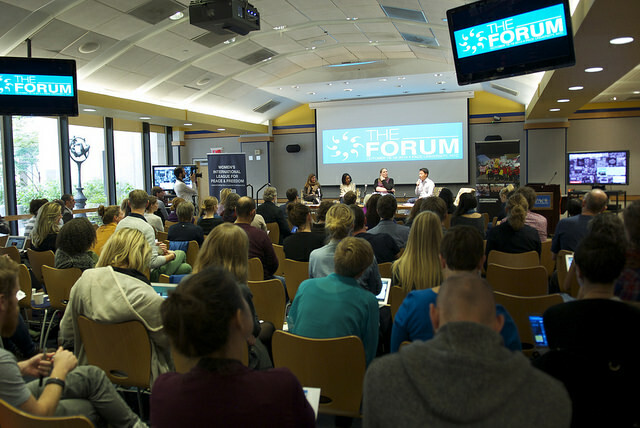 The 2014 Forum was held at Pace University and organized by Control Arms and the Women’s International League for Peace and Freedom (WILPF), which commemorates its 100 year anniversary in April 2015. Founded by women during the World War I to address the causes of war, WILPF is much-needed today as it was then as an NGO claiming women’s right and responsibility to participate in decision-making on all aspects of peace and security, including in advancing humanitarian disarmament. Please vote for Senator Leahy, Austrian diplomat Mr. Alex Kmentt, Human Rights Watch or others nominated for 2014 “Arms Control Person of the Year” by the Washington, DC-based Arms Control Association. Please follow us on Twitter at @4disarmament and see the calendar of upcoming events.